In this short tutorial, we'll get oriented with Castle's basic workflow by creating a new project, drawing a circle, printing some logs, and moving the circle with the arrow keys. You'll need a text editor and a few minutes. Castle uses a programming language called Lua, and a framework called LÖVE. If you're already familiar with LÖVE, you're in luck! Anything you can normally do with LÖVE will work in Castle. If you aren't familiar with LÖVE, we'll go over some of the basics here. 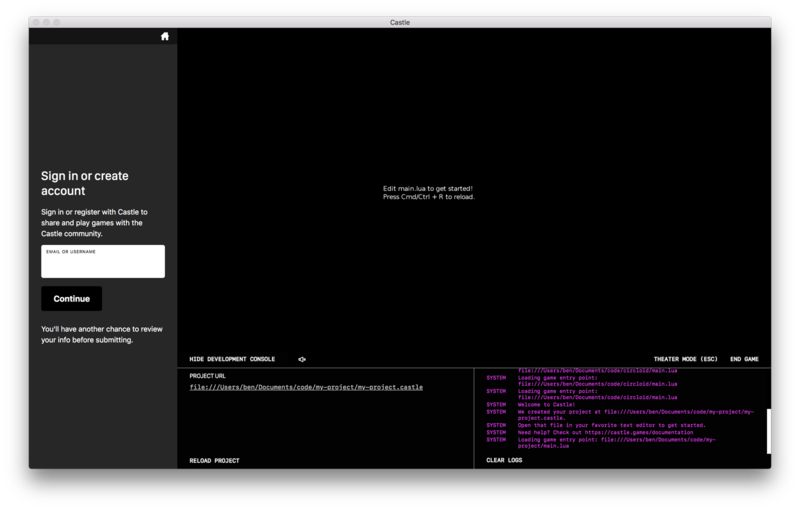 You might find the LÖVE API reference page useful to keep open while you work. If you don’t have it yet, download and open Castle. Inside Castle, click the button to create a New Project. 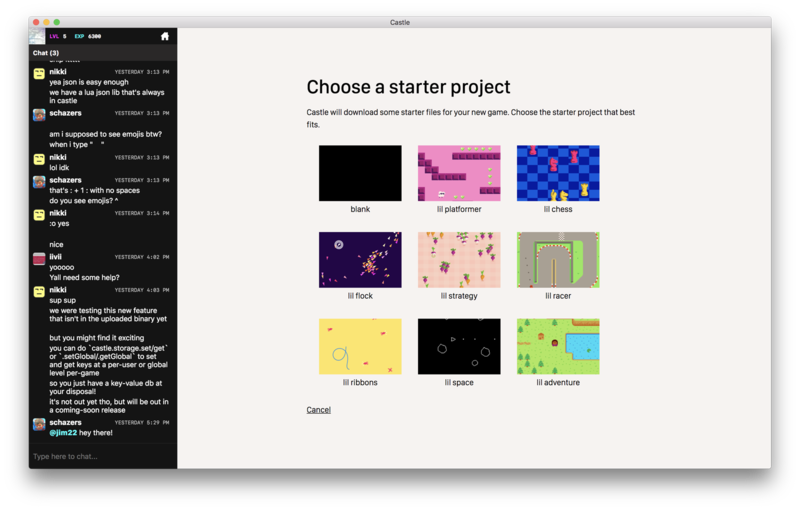 You'll see some different options for starter templates on which to base your new project. For the purpose of this tutorial, choose blank. When prompted, name your project. You can name it anything you want, but the rest of this tutorial assumes your project is called My Project. Castle will download some starter files for you. After it's done, go ahead and click the button to Open your new project. Most of the screen contains your new blank game. Since the blank template doesn't contain much graphics code, it's mostly just a black void right now, with some white text hovering in the middle. The Logs View on the bottom of the screen is where you'll see development logs while you work. Go have a look at the directory where you created your project. 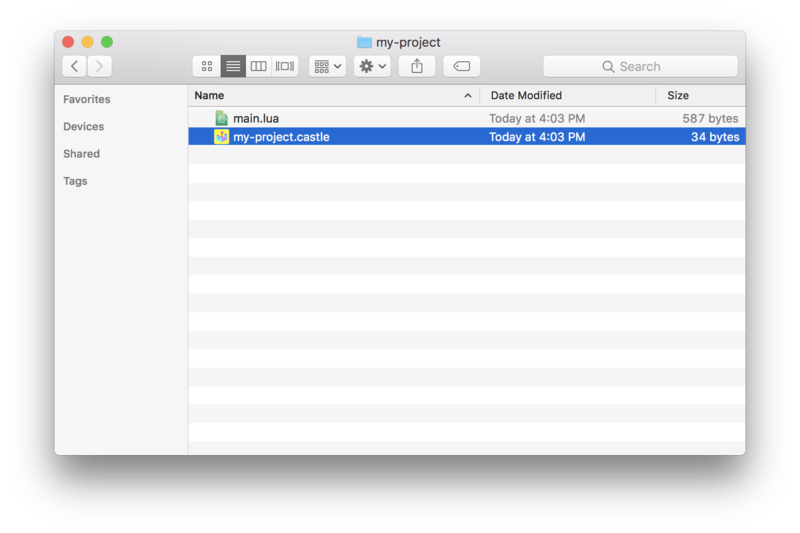 Your project directory should contain two files: my-project.castle and main.lua. The file called my-project.castle doesn't contain any code. Instead, it contains a few lines of configuration which tell Castle how to run your game. For example, you might notice it contains the line main: main.lua. You are welcome to change anything inside my-project.castle, but we won't cover it in depth in this tutorial. Instead, we'll focus solely on main.lua. Save your file and then click the Reload button in Castle. You can also use Cmd+R (macOS) or Ctrl+R (Windows) to reload. If you’d like to debug using logs, Castle has a built-in logger. You can show and hide the Logs View in Castle by pressing Cmd+J (Mac) or Ctrl+J (Windows). If you can't already see the Logs View, try pressing these keys now. Save main.lua, then Reload in Castle. Now try pressing the up arrow on your keyboard. You should see some logs appear. Let's move the circle around with the arrow keys. Save your revised main.lua, then Reload in Castle. Now try moving the circle around with the arrow keys. You should now have a simple program where you can move a circle with the arrow keys. What happens next is up to you! View the source code for the completed tutorial. Check out our list of example projects to see more ideas about where you can go from here. Need help? Or just want to chat with fellow Castlers? Join us on the Castle Discord!